I have mixed emotions about my blog post today. 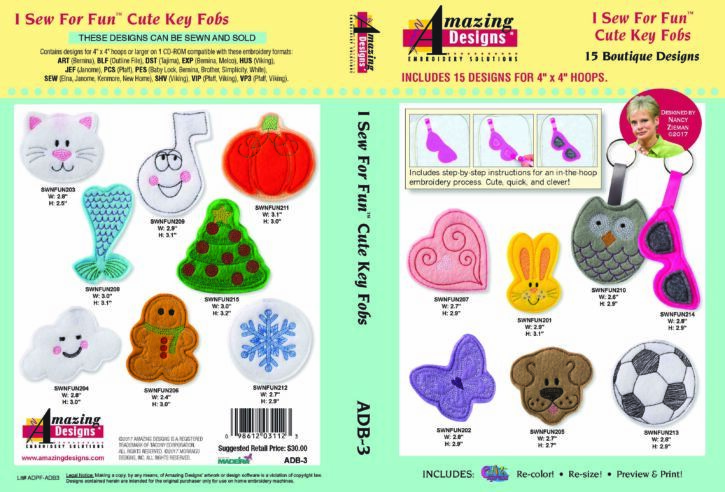 While I am so excited about the new I Sew for Fun book and all the products that go with it, I feel sadness knowing that the author and my dear friend, Nancy Zieman, isn’t here with us able to share and promote her new book. As most of you know, Nancy was such an inspiration in the sewing community. She was an example of a woman entrepreneur who started her own business during a time when men pretty much ran the show in the sewing industry. She was focused, driven and creative all the while being one of the nicest, humble, most down to earth women I have ever met. I do not think there was a mean bone in that woman’s body. I was supposed to film ‘Sewing with Nancy’ this past November 2017. In September 2017, my husband and I were on a flight to New Mexico to attend my grandfather’s funeral and I said to him during the flight…..I need to follow up with Nancy and plan the details for our filming in November. When we landed, I turned on my phone, checked my email and I had a note from Nancy cancelling our filming with her most recent diagnosis and informing me of her retirement. It felt like a pit in my stomach and I sent up my deepest prayers for her. But sadly, it was only a matter of months before her passing. I miss you, Nancy……..we all do. Thank you for everything you did for our industry and for being a mentor to me as I’ve grown my own business. You will always have a special place in my heart. Ok, well onto the fun stuff…..which is what Nancy would be wanting me to be sharing about today……I Sew for Fun! Nancy was blessed with beautiful granddaughters, Avery, Luella and Adeline, and the older two would Sew for Fun together with Nancy……as a team. 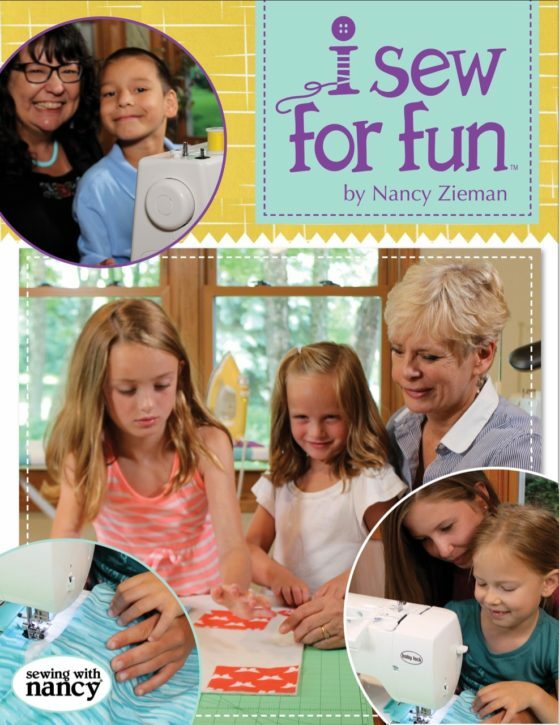 Nancy’s new book “I Sew for Fun‘ was written for the big partner (mom, grandma, dad, grandpa, aunt, etc.) 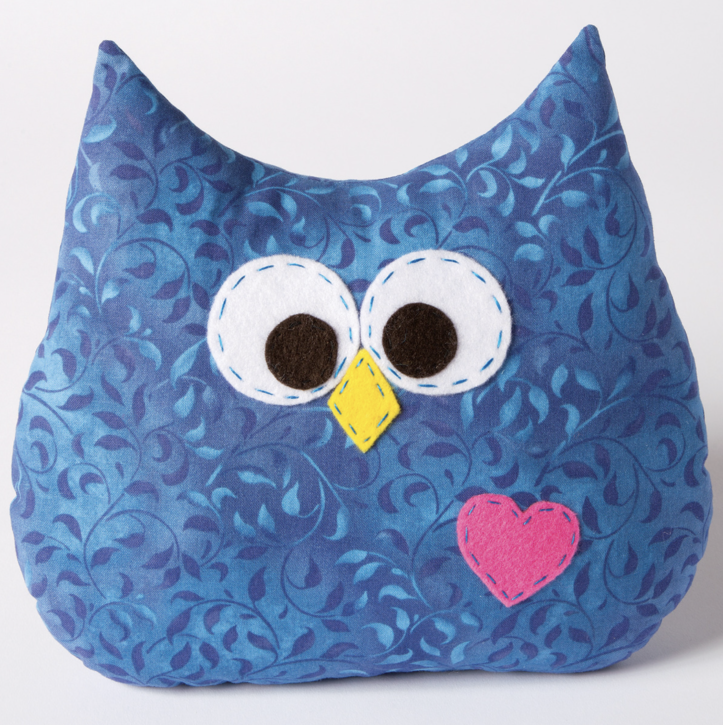 and includes projects to share and sew with a little partner (ages 5-9). It’s not about perfection…..it’s about fun and creativity and to get little ones excited about sewing and creating. 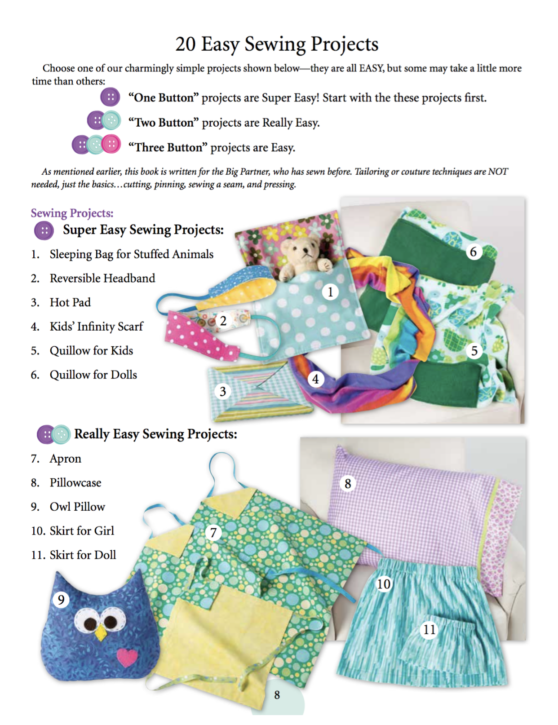 The book is filled with simple, easy sew kids projects such as an owl pillow, apron, doll quilt, drawstring bag, pillowcase, skirt, headband, art caddy and so much more! You can let your ‘little partner’ flip through the book and pick a project that they would like to work on with their ‘big partner’ and then work on the project together. The I Sew for Fun book also has a series of notions that are under the I Sew for Fun label. 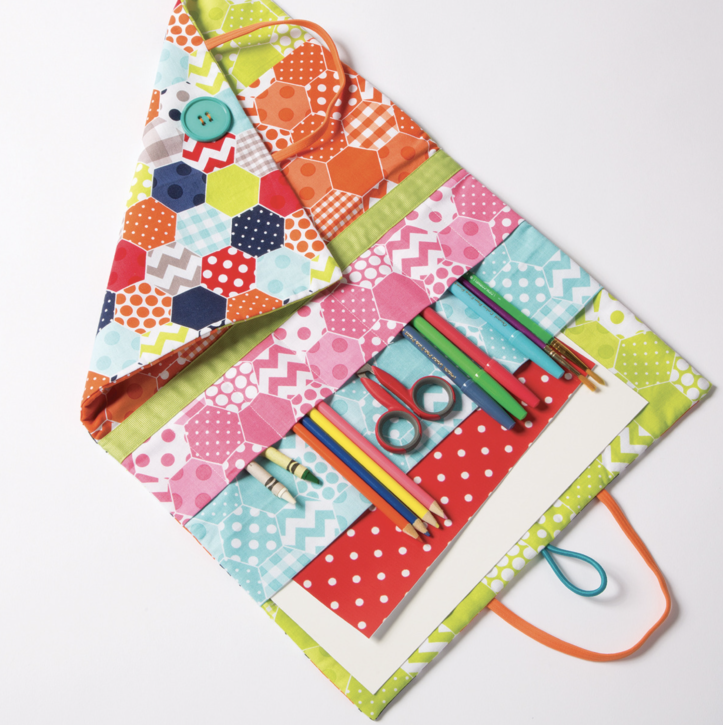 They are perfect notions to start your little one with their first sewing basket / kit. 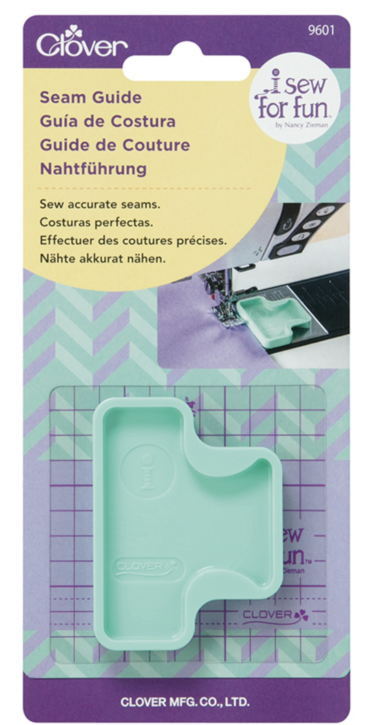 They include things like a retractable seam ripper, pins, magnetic pin caddy, wonder clips, etc. and they are all in pretty blue and purple colors. My favorite is the seam guide. Sometimes it’s hard for little ones to see the lines on the machine, but this enables them to have accurate seams and not have to look to hard to see if they are sewing the right seam allowance. You can check out more info. about all the notions by clicking HERE. There are a series of designs that can be used on your embroidery machine that also fall under the ‘I Sew for Fun’ category. They are available from Amazing Designs and are simple little projects that you can complete if you happen to have a machine with embroidery capabilities. I know that my kids love to watch the embroidery machine work it’s magic! You can purchase and read more about them HERE. 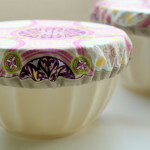 Another fun product is the Click, Print and Stitch. In addition to sewing, Nancy enjoyed creative time on the computer with her granddaughters—Avery and Luella—while they virtually decorated cupcakes and cakes. She saw how engaged her granddaughters were, how they intuitively knew what buttons to click, and how pleased they were with their creations. Nancy really wanted to experience something similar with Avery and Luella in the sewing theme, too. So, Nancy called her friend Eileen Roche with an idea for a user-friendly software program. After Eileen shared the possibilities available, Nancy and Eileen jumped into action and created this one-of-a-kind software program, Click Print Stitch. Click and choose one of the project designs included within the Click, Print, and Stitch Software. Let your creativity soar! Drawing tools include pen, rectangle, ellipse, rounded rectangles, triangle, diamond, star, and heart. Print your project on 8-1/2″ x 11″ Inkjet Printer Fabric Sheets (not included). 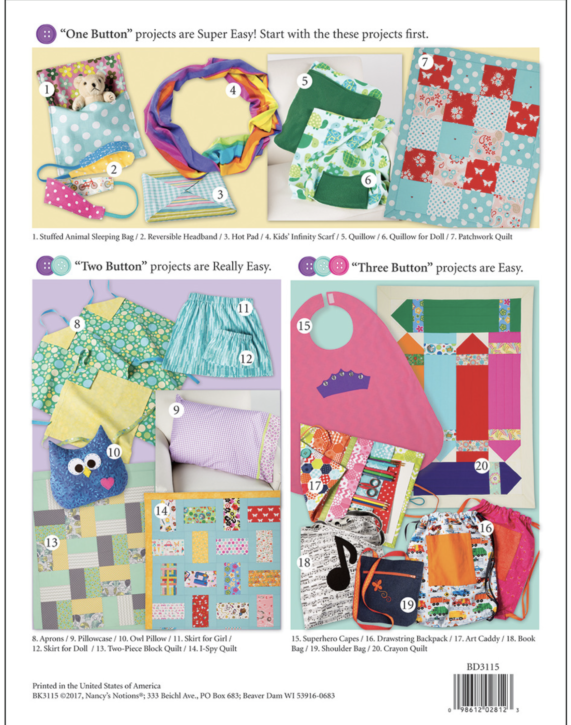 Stitch projects together following Nancy Zieman’s easy instructions (included). You can read more about the Click, Print and Stitch designs HERE. Lastly, Nancy released her first children’s book dedicated to her grandchildren. The Book is called The Flying Sewing Machine and it’s a great book to read to children of all ages. The illustrations are really pretty! You can read more about this book HERE. There are many projects in the I Sew for Fun book that are ones on my kids’ ‘to-do’ lists, but my girls really enjoy making quilts. I think it’s because those don’t require using any curved sewing lines and the smaller the squares, the more pretty fabrics they can include in their project. 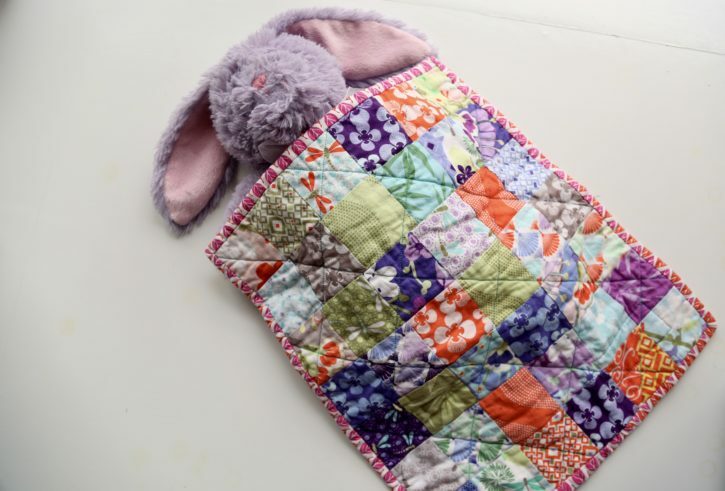 The I Sew for Fun book includes instructions for a simple small quilt (shown above) and then there are more designs that are more complicated, but nothing too tricky. There is information about batting, backing, quilting and binding. We may try to tackle some of the more difficult ‘three button’ projects this summer when we have more time. There’s nothing quite like seeing the look on a child’s face when they have completed a creative project from start to finish (remember my post last week?). They are so SO proud!! So how does that sound? Good, I hope! So in order to enter to win, you need to leave a comment here on the blog and tell me who is the ‘little partner’ in your life that you are hoping to introduce to sewing? That’s it! The giveaway will be open until Friday, February 9, 2018 at midnight (CST). Once I select a winner, I’ll contact you for your mailing address to send out all your goodies. Giveaway is open to US residents ONLY. I have two great-nieces that I want/need to teach to sew. I want them to carry on the family quilting tradition. I also want to sew with two of my great-nieces, and their mom. We got a sewing machine for the mom the Christmas before the family moved out of town and I only had a couple times to work with her. The girls are almost 5-1/2 and 7 years old and I can’t wait for the weather to get a little nicer so I can drive to see them and start going through Nancy’s new book! My sweet 9 year old neighbor is learning to sew. I’d love to give her these goodies! Beyond that, I have three beautiful grand nieces with whom I would like to work on enriching their lives with a love of sewing. It seems to me that sharing this experience with all the girls will bind them together even more closely. My new sewing partners are my grandchildren. They live in different states, but when we get together they are learning basic skills as preschoolers. My daughter is a very talented sewer, but my daughter in law did not begin until her 20’s when we purchased a 15 yard bolt of bottom weight with a decent drape and she made curtains for the travel trail or they lived in for around $20, finished. Still helping the daughter in law with basic skills, as well. I have two little partners that want to learn to sew. I’ve already gotten each of these granddaughters sewing machines, so now we need some projects that are age appropriate. I think this book will help us tremendously. My little buddy is my son who is 10. He is super eager but I’ve been putting him off cause I don’t know what to make with him. Now I’ve got some ideas! I am a gramma who would love to teach her 7 year old granddaughter how to sew. I failed to pass on my love for sewing to my 2 daughters but I am hoping I get a second chance with Julianna Jane. I have a great granddaughter who would love to learn more about being creative while sewing. my mom taught me to sew when i was 9 years old, i taught my daughter to sew when she was 9 and can’t wait until my great granddaughter is old enough to start sewing. I would love to teach my great-nieces but they live too far away. Their mother however loves to sew if she can find the time and these tools would help her a lot. Oh, how I would love to win this gift package! I would teach my two daughters, ages 5 & 3 (nearly 6 & 4). I am self-taught, but my mother and grandmas were great enough seamstresses to sew pageant dresses for me without a pattern. I wish they had taught me, so I want my girls to learn (and my son, if he’s interested). I have already begun teaching my older daughter, and she loves it. This article hit the nail on the head, though, when it mentioned the joy kids feel when they complete a project. My oldest is very much a perfectionist and task-oriented person, so making something on her own would make her the happiest little kid ever! Good luck to everyone else, too! Favorite sewing partners … my Grandchildren and their friends. I love helping plan sewing slumber parties. I pre-cut pillowcases and embroider the children’s names on the cuff. At the party, the children pick out which fabric they want for their pillowcase. Sewing machines are set up and THEY sew them. That night, they sleep on their new pillowcases. Boys are fascinated by the mechanical aspects of sewing; watching the needle go up and down and connect with the bobbin. Most girls just sit down at the sewing machine and ‘assume’ it works and are more concerned with the product than the process. During the summer, I would also invite my Granddaughter to bring a friend for an afternoon of sewing. Before a holiday school bazaar, I would help her make small items to sell. I want to share this with my granddaughters Sophie and Hannah! The think sewing is magical! My 5 year old daughter, Audrey, has been asking to learn to sew. This would be the perfect start! I would love to teach my grandchildren, Katie and Bodhi, but since I live in Canada and they live in Georgia and Florida, it’s too long distance. I have, instead, been introducing my sewing machines to the sons and daughter of friends. Brendan and Patrick are the two little boys who are most interested. They head to my sewing room every time they come over, even for a short visit. MacKenzie and her brother, William, come over as well but so far they love my creations but aren’t as interested in making their own. Perhaps if I win, they will develop more of an interest. My granddaughters I helped one of my granddaughters make a purse. My grandson loves to sit on my lap while I sew. My twins are 3.5 and already show an interest in helping Mommy sew (or picking out fabric for Mom to make something). My grandmother taught me to sew when I was 6 so I look forward to getting them started very soon! Both my daughter and son will learn the basics and more if they’d like! My niece McKenna is just learning to sew and would love this prize. I would love to share my sewing skills with her. My four year old daughter would LOVE this! She’s been helping me sew since she was about 18 months. She always asks when she’ll be big enough to get her own sewing machine. Teaching our kids to sew is a family tradition, and my daughter and I are excited to continue it. My 15 month old son is also enamoured with my sewing machines, so perhaps I’ll get to teach him as well! My little sewing partner is my granddaughter, Nora, age 4. She loves to hang out with me in the sewing room when she comes to visit! She likes being a helper with pins, choosing fabrics, and is learning how to use scissors properly. I love making things for her and with her. Oh how I would love it for my grandsons to be interested! The sewing gene skipped a generation as none of my daughters were ever interested. Hopefully these new child centered notions could help along the way. thanks so much! Hi, Great ideas! I plan to teach my great-granddaughter Anna who is 10 years old to sew. Her younger six year old sister has cancer and travels each day for radiation treatments. The older sister hunts with her father and grandfather and plays ball. Anna has not seemed to find her nitch yet and I am hoping that sewing will turn out to be a good thing for her. I’d love to use this as a guide to teach my 3 granddaughters to sew. They always express interest when they visit. I’ve got a machine for each one to use. They are all the perfect age ! We’ve made tooth fairy pillows and they loved it. I love sewing with my 9 year old daughter. She will be creativing her first 4-H sewing project this summer and is very excited. My grandson has always loved my sewing room, and he is curious about everything. I believe this will be great for him to learn with. I’m so glad Nancy Zieman created this for us to be able to teach our sewing partners not only how to sew but also about her. I would love to have this for my daughter Margaret and I. She is always eager to “help” me sew. I would love for her to have some projects to be really involved in. I have 3 great nieces all turning 13 in the next few weeks. I have made several items for them, now its time to get their sewing on. Thank You so much for making this available as a give away. I learned to sew as a 4-H child from my Grandma and as a former county 4-H agent and state staff member knew, appreciated, and learned from Nancy since the 1970s. She was so generous in sharing her knowledge and skills with youth, their volunteer teachers, and staff for decades in many ways (writing clothing project literature, teaching, etc). Now, I have a 5 year old grand daughter who wants to sew and Nancy’s philosophy in these new materials are perfect for her and me (the teacher). She was born without fingers on 1 hand: yet, I think she can do these projects. The sky is the limit for her! Thank you to Nancy and the sewing community for encouraging this!!!! 15 years ago I was sewing with my granddaughters M, F and S. Now years later I have another eager granddaughter – B – who loves to create. I’m hoping to introduce my oldest daughter to sewing. She’s shown some interest in it. Oh wow! What great resources! I have a 10 year old granddaughter who loves to spend time sewing with me. Her 8-year old brother also likes sewing….he’s very technical, so the accuracy and precision appeals to him. 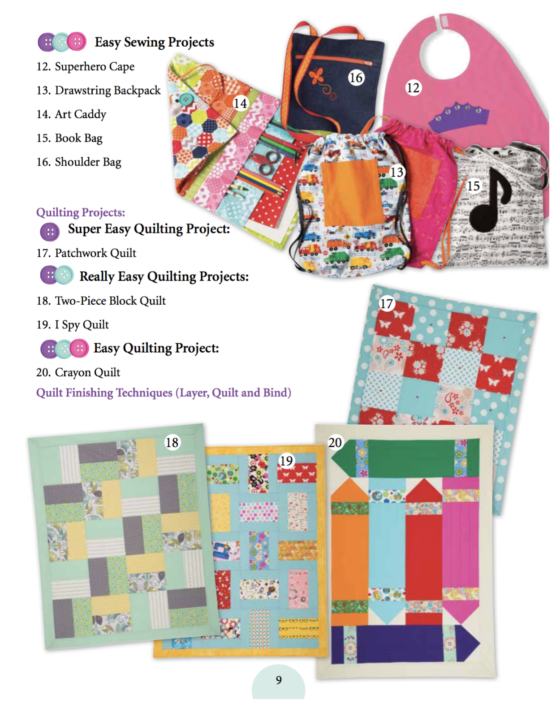 Their girl cousins, 6 and 8, are begging to sew and I would LOVE to have these resources! They don’t have a notions kit yet, either. What fun we’d have! I also volunteer and teach sewing at a local Montessori each week. I could reach more kids with the Click and Stitch. Thanks for introducing these amazing resources! I have 5 grandchildren and another on the way! Right now, my partners in sewing are my oldest grandson (7) and my oldest granddaughter (5). When they come over, we work together in my sewing room deciding on patterns and putting together fabrics for me to make them some outfits. I want to instill my love for sewing and creating on all my grandchildren, just like my mother and grandmother did for me. It’s such a joy to see their little eyes light up when they have created something! Would love to sew with my my 5 year old daughter R and my 9 year old son T.
A good friend of mine has a 12 year daughter. She has asked me to teach her how to sew. It would be great fun! My grandchild is always interested in what I am making. It would be fun to have child centered projects to work on together. My little sewer to be is my granddaughter, Cassidy Rose. Although she is too little right now to sew, I cannot wait to teach her this art. I already have a sewing machine just oiled and kept ready for the time when she can sew alongside her Grammy. 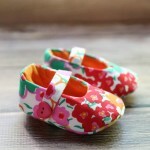 I can’t wait to start sewing with my daughter Juniper, who is 3. We already do lots of crafts together and I think she will love sewing too. I am in the (long) process of making a quilt for her doll cradle and she is so excited to help pick out the fabric and asks me almost daily if it’s finished. 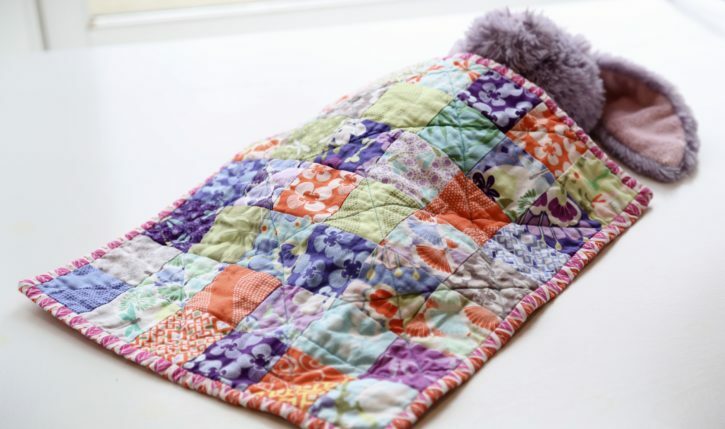 She also loves the handmade quilts she has – one from me and others from family and friends. I actually am hoping to work with my grandson who wants a minecraft creeper quilt. I have a 4 yr old daughter who would absolutely love this! She helps me often and this would be perfect! She is the reason I’ve taught myself to sew and dive into patterns and I’d love to pass my joy on to her! My 8 year old granddaughter is longing to learn how to sew. 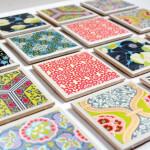 I would love to surprise her with these goodies to inspire us for a variety of crafts we can work on together. A toy sewing machine was not enough for her, and she is itching to learn how to use my sewing machine. I am hoping to sew with our niece Simone. She is a creative spirit who has a generous heart and I think she would love to make gifts for her friends and perhaps become enthusiastic about making kennel quilts. I have a 6 year old granddaughter, Holly. I gave her a sewing machine for Christmas. Your package would help with our sewing time. My daughter who is only two right now is going to be my little sewing partner (fingers crossed she enjoys it!). I cannot wait to work with her on learning to sew. I am excited to teach my granddaughter to sew. We have already done a few hand sewing projects together. I LOVE this set. My daughter is now 27 and loves to sew, smock and embroider and so I have now turned my attention to my friend’s daughter who is almost 10. She has sewn a little and was even bought a machine for her birthday last year but does not yet have a good instruction book. This would be perfect. I have watched Nancy’s TV series for many years…I have learned so much. My little partners are my granddaughters–Madi, Auna, and Lydia. I have 8 granddaughters that will all be about the “learn to sew” age at the same time! I can’t wait to teach all of them! I would love to teach my grandson and grand daughter how to sew. I’ve already helped my grandson sew bow ties for his church outfits. 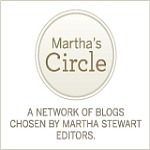 I’ve been leading Marmee’s Sewing School for my granddaughters and great-nieces for 3 years. NOW I have a grandson who wants to join the ladies – but I hadn’t figured out what to do with him yet. And now Nancy has given me some ideas. 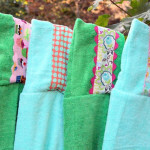 This would be a wonderful addition to my summer sewing school for all! My granddaughter is 2 1/2 and loves for me to make things for her. She is the reason I started sewing again and I hope to pass the love of sewing and crafting onto her so she can sew for her own grandchildren one day! So very sad that we lost Nancy!! I have two granddaughters, ages 10 & 12, who I would love to teach to sew, if I can get them to stop long enough to get their attention! Thank you for a wonderful giveaway! I’ve been wanting to teach my 2 granddaughters, Laci & Tegan, how to sew for some time now. I’d even like to have a project for their younger brother to participate in. Just would love for them to feel the satisfaction in completing a sewing project, & something that they can always turn to in life. I have a 4 1/2 year old granddaughter who is so excited to be “bigger to sew”! She’s modeled all The Cottage Mama patterns telling everyone “Gramma made it”! I plan to get her a little sewing machine for her 5th birthday and would love to have Nancy’s book to guide me through the process of teaching her to sew for fun! Such a legacy to pass on and such a life skill for our little ones to learn! My sewing partners are my daughters, who are 9 and 5. I’ve sewn for years, but I’ve been struggling to find a good way to get them started. My little sewing partner is my granddaughter. She loves to do all kinds of homemaking projects. When she was 2 years old she would spend time with me in my sewing room color coding all of my pins in the pin cushion. She is very talented and has an artistic eye. She is anxious to begin learning to sew. She would love to make the projects in this book. My daughter Alana (almost 7 ) Just got a sewing machine from her grandma for Christmas. She has been begging every day to sit down and learn to sew with me. These look so fun! I loved to watch Sewing with Nancy! So sorry to hear of her passing. 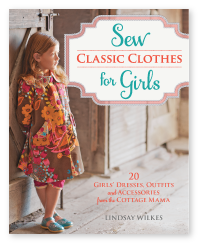 I have two young granddaughters that I would love to introduce to sewing with Nancy’s book and ideas! My almost 6 year old son is so excited to start sewing like Mommy. I could see him liking making a sleeping bag for his favorite stuffed animals on his bed. I would absolutely love to share this with my niece. We were just looking at things in my craft room a few days ago and she was asking me to make things for her. I suggested we make them together but she thought they looked too hard. She’s very interested in learning and I would love for her to be excited about projects she feels confident with. I am blessed with five beautiful grandchildren that I sew and mend for. My two oldest granddaughters, Leta age 6 and Emma age 7, are interested in sewing! Leta lives in town and sat on my lap as a toddler when I sewed. Your give away sounds fabulous and is just the tool I need to teach each granddaughter how to sew. I have l been a fan of Nancy’s PBS program, Sewing with Nancy and her store in Beaver Dam, Nancy’s Notions. Nancy’s contribution to the art of sewing and the sewing industry is immense. She has been a pioneer and inspiration, she will be missed. Lindsey,thank you for this give away and for your inspiration and contribution to sewing. My granddaughter has sensory issues so I am quickly learning to alter things. She helps me with sewing math and cutting. My grandson 2 1/2 is in the me too stage, so he have to measure him every month. We make small tote bags so they can bring and store their little figures in. I work with 5 sixth grade students and they all love hands-on projects. This would be absolutely awesome for them! 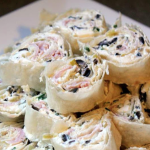 We like to make 2 of everything – one to keep and one to give away. They learn functional skills as well as life skills – giving back to the community! I enjoyed reading your beautiful tribute to Nancy today. I remember wateching her show on Public Television in the early days of her career. What she accomplished in her lifetime was incredible. I love that I can still learn from her online. I have sewn for fifty five years. I learned to sew at age eight. It has been a lifelong hobby that has brought me so much pleasure. Most of my working life I sewed with little support and certainly no friends who had a common interest. Now in my retirement and with the online sewing world I have many new friends of all ages who love sewing. After raising three sons I have the joy of two granddaughters, ages two years and two months old. I simply cannot wait to share the joy of sewing with them!! Also, thanks to you and your beautiful patterns, as well as fabrics, I make them beautiful dresses! My granddaughter and I have made a pillowcase. Next we went to 18 inch doll clothes, we had a sewing pattern from the fabric store. Since then I have discover at Nancy’s Notions a better method for making doll clothes but that is a little too advanced for my granddaughter. Appreciate the opportunity to win this book, so that we can explore more idea’s. I think the owl would be the first one for us to try. I have hopes of getting granddaughter interested again, since our doll clothes sewing episode. I would love to introduce my 6 yr old grand daughter to the wonderful world of sewing! Hoping to sew with my 7 grandchildren, boys and girls! I love your post! I gave my 7 year old grand daughter a sewing basket for Christmas with monthly sewing classes with Grandma coupons. She’s so excited to learn how to sew & I’m loving having this special time with her. I love teaching her something that I love that was passed on to me by my mom & Grandma. Looks like so many fun projects to make! First of all, thank you for this wonderful giveaway! My 10 year old granddaughter will be spending the summer with me and it’s her wish to learn to sew like me! I’ve made many adorable outfits for her since she was a wee one. I was taught by my grandmothers and am looking forward to our lessons together and passing on the love of sewing! I am so sorry to hear of the passing of your sweet friend Nancy. Losing someone we are close with is never easy. I have a 14-year old that knows how to sew, a 6-year-old, 5-year-old, 2-year-old and one on the way that I know will all love to learn to sew. My 14-year-old loves to teach her younger siblings! I’ve been seeing from your patterns for several years now and thoroughly enjoy every one of them. 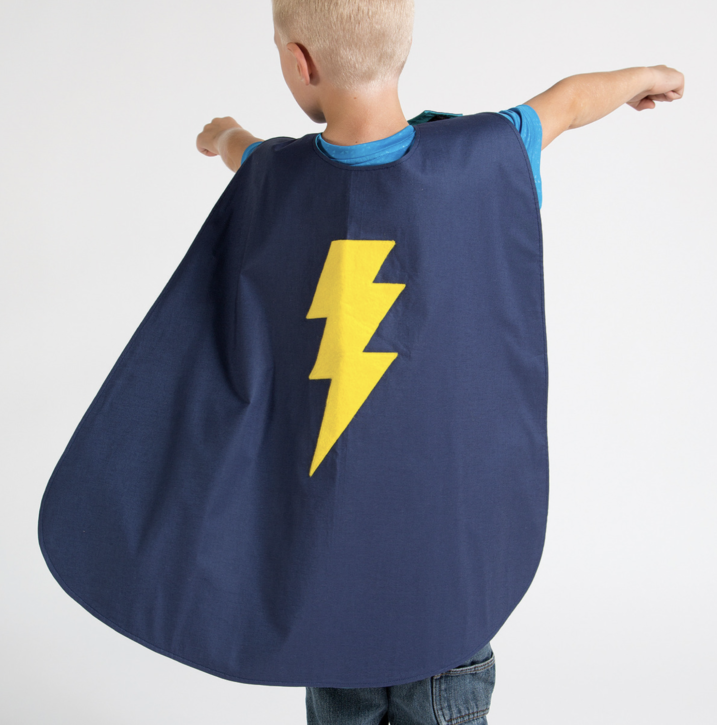 My grandson showed interest in my sewing machine when he was 5, so with him on my lap guiding the fabric he picked out, we made pillowcases, a hero cape, a headband (for the hero), and a small blanket. He would tell his friends at school about “Grandma….the one with the sewing machine!” I was thrilled when my other two grandchildren (girls) decided they, too, wanted to try out the machine. It is a great memory to share. I have 3 granddaughters that are the prefect age for learning to sew. What fun these products would be to try with them. Thank you for a beautiful tribute to Nancy. Oh! This is so exciting! Nancy touched four generations of my family. I now have four granddaughters, I want to make sure they develop a love for sewing. I’d like to introduce my grandchildren to sewing and these ideas and products are perfect. I watched Nancy’s shows from the beginning and have been inspired by her. I hope to teach sewing to my grandsons as well as my granddaughters as soon as they are old enough. I taught sewing to all my sons and my daughter. They learned the basics, but were not interested in taking it further. I hope that my grands will be more interested in the art of sewing now that I am retired! My little buddy is my daughter, Averlie. She would be so excited if we won! She is the kindest and easy to teach little girl. Her name is katelyn Myslivy. What a neat idea to get kids creating and sewing! My Little Partner would be my youngest daughter, Jolene. She is nearly 7 and will follow in the footsteps of her 3 older siblings: 2 boys and a girl. and will be making a doll quilt. I too get emotional thinking about Nancy and I didn’t personally know her. I watched Sewing with Nancy for a long time . I have a grandson and grand daughter who are interested in sewing. I do feel as if I have lost a sewing mentor. I watched Nancy for many many years. I have sewn with a granddaughter and her brother. They like going to quilt shops to look at the fabric for ideas for their Elves on the Shelf. My oldest grand is off to college, but left her sewing machine at my house…that’s okay…trips home mean any sewing is done here and I get to share more time with her. Her sister has begun to be more interested in the sewing process and looking at the projects shown I know there are several that we will enjoy starting together. When she is ready I will get her a machine, but for now there are plenty here for her to share. One of biggest joys was the summer older grand made 50 stuffed animals to give to her huddle leaders – one a fireman and one a policeman – to have for children in crises. Oh this looks beautiful and fun! My little helpers are 9,7 and 4 they all love to watch me sew and the older two have tried a couple of projects. Thanks for the giveaway! So many fun ideas and projects! My nephew wants to learn how to sew and I have started to teach him. My granddaughter, Lauren, and I would make a great sewing team. Not long ago, I introduced her to my sewing machine and even helped her make a simple pillow. Without a doubt, I believe she would be a natural at the sewing machine. It would be a great joy guiding her into the happy world of sewing!!! Many of my grandchildren have done a little sewing with me but one of them is especially interested in sewing and has made quite a few pillows so far! My 7 year old granddaughter recently asked me if I would show her how to sew. We started with hand stitching and we’re looking forward to doing some machine work next time she spends the night with Grammie! I have 3 granddaughters who all love fabric and want to sew with grandma! The 6 year old has done some sewing and wants to be a fashion designer. I have two great nieces that I sew with. This would be “sew” much fun for us. I would to teach my grandson how to sew. He wants to make a pillow for his favorite stuffed monkey. First, Thank you for the opportunity to win this! My little sewing buddies are my 3 granddaughters…Lexi age 8, Je’nene age 8 and Izzy age 7! I love sewing so much that I have been sewing since I was their age. Really want them to get the bug and this would really help! I recently had to move in with my daughter and 4 grandkids due to a serious illness. I have worked hard all my life and dreamed of retiring and spending time teaching my grand daughters to sew. My dream has now come true. I would love some guidance from Nancy’s book. I spent many days watching youtube videos of her during recuperation. I am looking forward to seeing with my granddaughter Eleanor age 6 . We started with hand sewing in September. She loves it. When I saw these products the first time I bought all of them and the story book, but I still need to get the computer program one. I am looking forward to a fun filled summer sewing with her. My granddaughter Abby who is now seven years old is my sewing partner when we are able to be together. My son is in the military so for the next couple of years they are overseas. So Abby and I talk about sewing over FaceTime and I had taught her father my son to sew when he was young so he can assist her until they come back to the states. Abby recently told me she didn’t have sny more sewing needles or equipment so for a surprise I have put together a sewing box with supplies and projects to do so we can do them over FaceTime that I will ship out next week. Before they left we worked with my sewing mschine where she made a doll dress and a dress for herself. I started teaching her at the age of four to hand sew things which she enjoyed immensely. I am looking forward to their return do we can complete many more projects in the future. Thanks for the opportunity to win these items! I would like to teach my great niece and nephew. Once they have started down the path of creativity, I would really like to start a class at my church for some of the young creative children!!! I have been teaching my granddaughters to sew when we are able to get together. Now it is our grandsons’ turn. Thanks for the post. My granddaughter Abigail is 7 and I’d love to teach her to sew. The book has such a nice variety of projects. So thankful for Nancy’s gift of sharing her tips, techniques and ideas to teach young ones to sew. I’m actually teaching my sister in law to sew, she’s older then me!!! And I’m almost 60! But I’d love to teach my grandson to sew when he’s a bit older. I have two honorary granddaughters that love to sew with me. We recently finished quilt tops for their newly painted bedrooms. They would love any new tools or projects! I teach school and just filled out a purchase order for a sewing machine to use with students in my classroom. I have many little people with whom I can share the joys of sewing and the sense of accomplishment it brings. I would love to teach my granddaughter to sew for her American Girl dolls. As a mom of 3 sons, it is a delight to have a granddaughter who shares my love of dolls and I hope to introduce her to the love of sewing, too! Thank you! My 11 year old grandson is taking a life skills class in school this year. They have done a couple of simple sewing projects and he is very interested. These wonderful products would be great to help him learn and it would be fun for me to help him. Thanks for the fantastic give away. Oh, such a sweet post! Thank you so much for sharing it with us. My little partner is a precious little girl from church who is homeschooled…each week we get together to do a sewing and a cooking lesson…it is such a blessing to me! Thank you for hosting this giveaway! I have 2 daughters ages 9&7. They have joined the church quilters a time or two when there has been a snow day and loved it. I am not a sewer myself so learning with them would be fun! I have 3 daughters that I would love to introduce to sewing. The oldest is almost 5 and it was when I was pregnant with her that I began sewing. I have a 16 year old that not as interested in sewing, however when she saw the cute projects she was totally excited to learn to sew them for her two nieces who are 3 and 2. I can’t wait to try them myself! I too miss Nancy. I watched her shows with my mom. Hoping to pass on her legacy to my daughter. Thank you so much for the giveaway. I have 7 granddaughters- 5 have done small sewing projects with me and 3 that are still fairly young. I am always looking for fun ideas. I’ve been inspired by Nancy Zieman’s “you can do this” attitude and approach to sewing for many years. I love sharing that inspiration with my four grandchildren and passing on the tradition — and the joy — of sewing and creating to another generation. I know we would put this gift package to good use! I would love to use the giveaway to teach my two granddaughters to sew. I loved Nancy also, such a loss for the sewing community. God bless Nancy who was such an blessing to all of us. I have four darling Granddaughters who want to sew just like their OMA. My fingers are crossed. My 12 year old granddaughter and I have dome some very simple projects. This book would give some ideas of what she wants to make. We could do them together. I can hardly wait to introduce my 5 year old granddaughter to sewing! Every time we Skype, she asks me if I am going to bring her a sewing machine and teach her to sew. We live 3000 miles apart and I am plotting how to do this! Thanks for the fun! I want to teach my niece how to sew. I have 2 granddaughters that really want to learn to sew. What a great book! I want to teach my little (almost 2, on Friday!) year old daughter to sew when she’s a little older. Right now she enjoys putting her foot on the sewing machine peddle with mine as I sew. I was just thinking yesterday that I wanted to start laying the foundation for sewing with my 2.5 year old granddaughter, Audrey. My sweet grandmother taught me to sew, it’s an activity I still love 50 years later, and I cannot wait to pass it on! In a few years, I’ll start with my 8 month old granddaughter, Finley, as well! 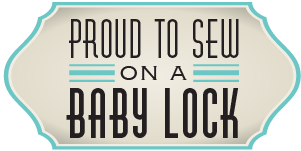 Thank you so much…I have been teaching my great niece to sew ….along with letting my 4 year old grand daughter learn about the sewing machine and serger. She told her mommy and daddy we did surgery on her skirt we made. I have 3 grandchildren, but only one living near our house. She lived with us from the age of 2 months until almost 4 yrs old when her Mom/Dad moved to their own place once back on their feet again. I loved having her here during that time and she had tons of quality time with Grandma. She would get up and come running to my sewing room to sit in there all day with me. When new fabric would arrive in the mail, she got SO excited and has to rip it all open and unfold every bit to see it and then each piece got a huge hug from her. When I had smaller pieces laying around, she was collecting them and stashing them into a small bag I had given her. Every once in awhile she would dump them all out on my desk and go through them. It was SO cute. I know, if any of the grandchildren I have that she would be the one who would just love spending time with me to learn. First of all, sending a hug your way, Eventhough I never had the pleasure of meeting Nancy in person, trough the years she was my favorite teacher, she always brought something new to the table and make sewing exciting and fun. I am sure she is watching over us with a happy smile! I love the quilts you made with your children. I hope I get to teach my niece next time I see her. Thanks for the inspiration and the chance to win! I have worked on a few project with my daughter, but she would love to use this for some fresh ideas! My sewing partner will be my 6 year old granddaughter. I am excited to teach her to sew. My 2.5 year old daughter who sits with me at my machine. My dream finally came true last May when my son and daughter-in-law had our first granddaughter. Although she is only 9 months old, I’m living for the day when I can teach her to sew. I’ve watched Nancy Zieman’s shows for years and learned so very much from her. Would so love to pass along the passion for sewing to this sweet little girl. Thank you for the opportunity! 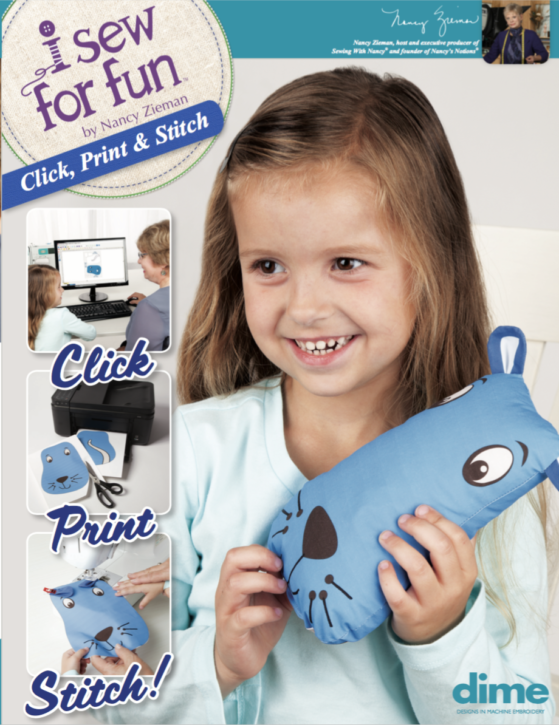 Thank you, for continuing the Nancy Zieman tradition of fun filled and user friendly sewing experience.! My 8 year old daughter and I will continue our long family sewing tradition by learning how to sew together. I have an almost-eight year old who really wants to learn to sew! And my younger daughters have been showing strong interest in sewing as well. I have taught my 10 year old granddaughter to knit. I just recently bought a sewing machine and have chatted with her about learning to sew by starting out making pillows. Reminds me of fond memories I have of watching my grandmother sewing on her old treadle machine. I started with my granddaughter this summer on learning to sew. I had selected a set of three pillows that were marked as good for beginners. Looking at the pillows I agreed that they should be simple. We went shopping for fabric and she came to spend a week with Grandmama for special time. When we actually began making the pillows the instructions were worded so badly that I would have to read it over and over to figure it out just for me. I had hoped to be able to work with her on one and be along to guide her with the other two but I wasn’t able to do that because of badly written patterns. This looks ideal for making a fresh start! My granddaughter is 8. She’s been sewing with me for a year. Its fun times. She wants her own sewing machine so she can do her own sewing…will be exciting.. I would love to teach my little girl to sew, she’s just so interested in playing with fabric as it is. I have been wanting this book for my little girl who is excited to learn how to sew and all the other treasures would be so fun to use as I teach her! My little sweetie loves to pretend sew through my scrap stash on her toy sewing machine but is getting ready for the real deal! We would be so blessed to win this giveaway and it would give us one more beautiful opportunity to build our mommy/daughter bond creating endless masterpieces with fabric!!! Thank you so much for your blog post and for your beautiful tribute to Nancy. The sewing community truly lost a wonderful person! Thank you, too, for the inspiration of teaching our 6 1/2 year-old granddaughter to sew. Since we live on opposite sides of the country (she’s in Florida and we’re in California), I never gave it a thought about passing on my love of sewing to her through teaching. Though she knows that I sew (having made her costumes, dresses, doll clothes and toys), I truly never thought about teaching her! We plan to visit in March and I promise to bring out our daughter’s sewing machine and help Elizabeth make a blanket for her doll or perhaps even a pillowcase for her! My sewing partner is my daughter!!! She loves fabric and can’t wait to start sewing! My little girl is turning 6 this month. She loves for me to sew things for her and clothes for her doll. She has made a pillow and a blanket for her doll. Would love to have this book and all those lovely notions to help my daughter (and her little sister) fall in love with sewing! Thanks for the giveaway! I was so sad when I heard about Nancy’s passing. I’m still considered new to sewing, and I would love to teach my 7 years old son to sew, since he saw how I made his costume last year. And maybe I can teach my daughter when she’s old enough to understand (she’s turning 3). My daughter! She’s 2, and she “helps” me trace patterns & clip fabric together. My granddaughter is 5 and is interested in sewing clothes for her assortment of dolls. Right now we just hand sew the doll clothes together. This bundle would be so great to win. Thank you for this opportunity. I have three granddaughters that are just the age to start them on their “love” for sewing. When my granddaughter is old enough, teaching her to sew would be a pleasure! Since I don’t have grand children of my own, I am “Auntie Auntie” to my great nieces & nephews, and little friends. My friends have adorable children, and I have sewn aprons, Halloween bags and Easter baskets for them. My friend Christy told me that her daughter saved up her allowance $ to buy a sewing machine, so she could make awesome things like me! I want to take this child and her Mom on a shop hop this spring, and plan on getting this book for her. I have three granddaughters; two are 9 years old and the youngest is 3. I’ve tried introducing sewing to all of them with limited success. I really think the 3 year old is going to get the bug! Thank you for sponsoring this great giveaway. 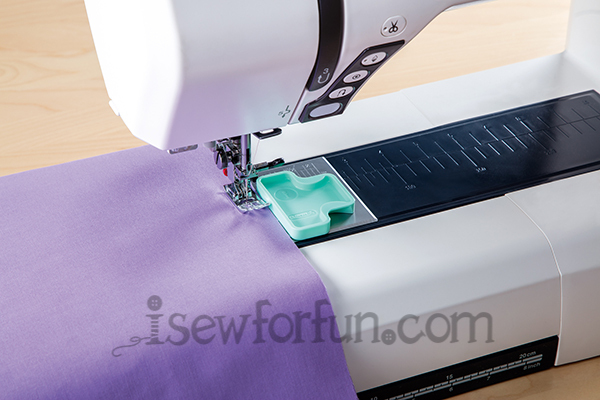 I would love to introduce sewing using this fun method! My daughter is 6 and we just started homeschooling this year. I’d love to start her on little projects and give her a new hobby she can enjoy. Our neighbors have two little girls that I would love to teach how to sew. That book looks like a fun way to tstart! I would love to get my grandkids interested in sewing! My little sewing partner is my beautiful granddaughter, Shirley Perlene. Last summer I began teaching my 11-year-old niece how to sew. She has Down Syndrome so these projects and tools will be perfect for her! She already loves my “machine” that has three speed settings—she feels like she’s in control. I love Nancy’s video and the concept of big and little sewing partners. Once again Nancy shines brightly; we all miss her. 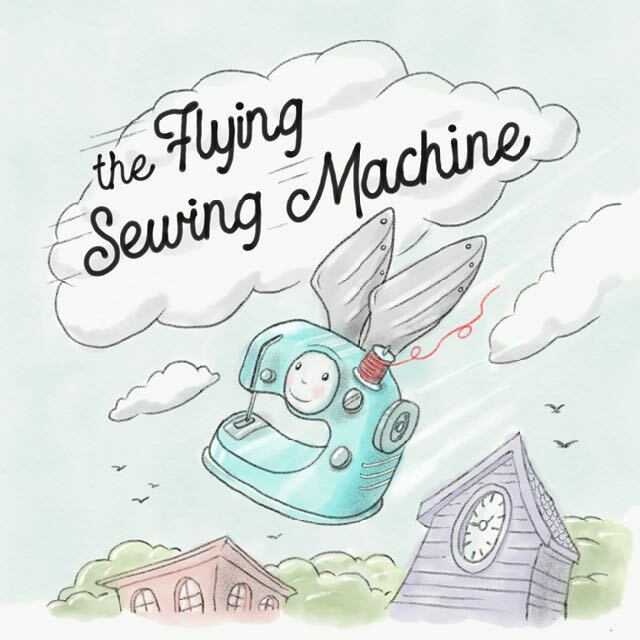 Last month, I gave my granddaughters, the book The flying Sewing Machine. Nancy taught me a lot of good sewing techniques. I would love to use Nancy’s books and tools to teach my granddaughters how to sew. My three daughters ages 1, 3.5, and almost 6. The 6 year-old is very interested at this time. She wants to help me whenever I work on a project. I learned to sew from my mom. It’s something that is special to me and has some really great memories. I”m looking forward to teaching my children as they grow interested. I want to start teaching my granddaughter to sew where she can start making her doll clothes then on to sewing for herself. My little sewing partners are all four of my children. I have taught them to sew basic straight lines but it would be really neat to have some guidance how to teach them to so actual products. What a wonderful getaway! I plan to introduce my littlest partner in sewing, Avery, to this book when she is older. Will also check with my grandson to see if he is interested and I think he will be. I’ve been teaching my grandson to sew for awhile, and now at 5 he can sew his own pj pants. He’s anxious to help me teach his 3 year old sister to sew and he would love to have his own special sewing tools. I have 6 little persons, the oldest is 10 & he & I have enjoyed sewing for many years, with him on my knee at first & me guiding. Now all of them down, to the 1 year old, desire to sit on my knee. They like to push the “gas” when I’m doing parts that need my attention so I’m so glad my Janomes have the speed control! All of them have their “wish lists” & I often hear “Grandma & I can sew it. She can make anything” lol not quite. We are expecting our first grandchild (it’s a girl!) in March. I am hoping she will enjoy sewing. Our daughters didn’t get into sewing (yet) they rather play their musical instruments and are now both HS band directors, but they have told me they have memories of my sewing machine set up on the dining room table most of the time and usually making clothes for them or quilts. My Mom sewed a lot and I miss being able to call her when I have a question, even after sewing for more than 40 years, I still have questions! Thank you for the giveaway, I too was so sad about Nancy’s passing. I am teaching my 7 year old grandson to sew. He started when he was three or four by playing with my discarded trims and scraps. He referred to the activity as cutting ribbons. He’d ask Grandma can I cut ribbons with you? Now he’s learning to use my sewing machine. I want to start teaching my 5 year old granddaughter and grandson when he gets older. He is only one. My sewing partners are my son and daughter, ages 7 and 5. They are always interested when my mom or I am working on a project and we try to include them as often as possible! My granddaughter loves to make all sorts of things with me. She enjoys sitting on my lap and sewing with me. Looks like lots of great ideas that she can pick from and make. 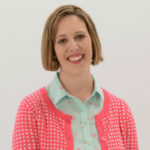 I appreciate your thoughts on Nancy Zieman. I never met her, but always admired her. I think everyone in the sewing community feels her loss, and I’m so sorry that you lost a personal friend. I sew with my seven -year-old granddaughter Natalie. We have made a couple quilts for her dolls and a pillow for her mom. She also loves shopping in fabric stores and has an eye for fabric with mermaids, cats, and hedgehogs. My stash has grown in some ways that I hadn’t really planned. 🙂 And we would love some sewing notions! I started teaching my little granddaughter, Shelby, to sew a little over a year ago. She really loves it too. So far she’s made a pillow, a doll quilt, and a doll dress. I hope the next time we can work on something for herself. She is such a busy bee it’s hard to find time for us to get together, and she’s only 10! My 6 year old granddaughter has recently requested that I teach her to sew. What a wonderful way to start! I teach sewing to kids at a nearby school. IN addition, I’ve started a “sewing club” for kids in my neighborhood and we have so much fun. I can always use more tips and suggestions. Nancy is such a loss but her latest book continues to teach and inform us all. My Mother taught me how to sew because I was a very tall girl and nothing fit me properly, she was taught by her Mother for the same reason. My little partner is my Grand daughter, she is 6 now and is so curious about everything. At the moment, she and I bake together baking various cookies etc, but I would love to pass down the love of sewing to her. My daughter Matilda turns 6 in April and I would LOVE to make this next year her year of learning to sew. She’s spent countless hours with me at the sewing machine watching and occasionally “driving”. She’s done a fair amount of hand sewing on embroidery hoops and I think she is ready for the machine. I am mostly grateful for her appreciation of handmade goods which I think is an excellent start for any crafts person. Oh my! the reason I started to sew again is my granddaughter. We waited for so many years before having a grandchild and I just want to make her everything now. Having her is what has inspired my love of sewing again and has inspired me to undertake my first quilt. I feel I just don’t have enough years to make her and her new little sister all the things I want them to have. I would love to teach my two granddaughters (ages 5 and 7) how to sew. I’ve been wondering just how to start, and this book looks like the perfect answer! I have an almost 9 year old looking over my shoulder, she would love to sew these fun projects. My granddaughters are 3 and 1 so it will be a few years before they can sew! I have loved Nancy’s books for many years, I have 6 on my bookcase by my machine and refer back to them often! I hope to instill the LOVE of sewing with my granddaughter. She is so proud when she gets a dress made by Nana, I hope she will want to make her dolly clothes. I learned by hand sewing as a very young girl, moved onto sewing through Home Ec classes, and enjoy earning Best of Show ribbons for my sewing at the State Fair. My six year old just got a sewing machine for Christmas. 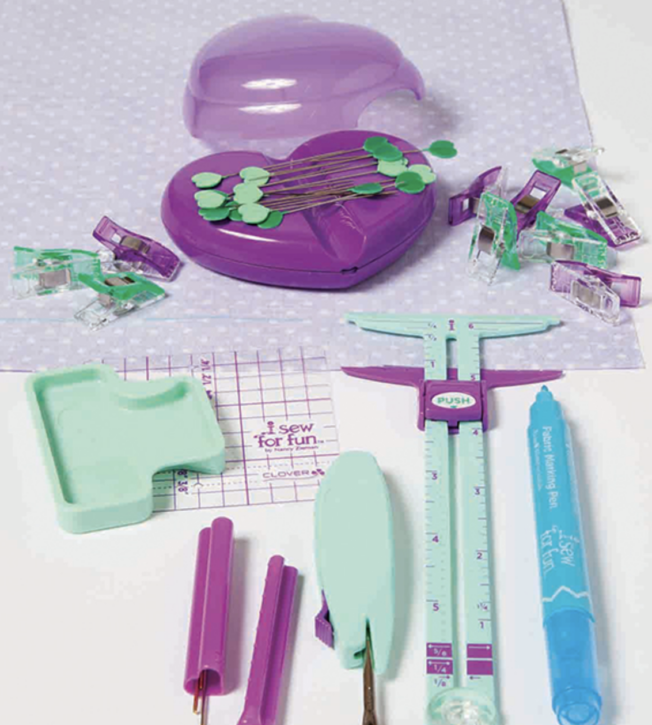 She’s excited to sew and this set would be perfect to guide her learning! My daughters (age 4 and 5) have taken a special interest in helping sew this year. They begged Santa this year for their own sewing machine so they could make their babydolls matching dresses. There’s is nothing more special then spending this sweet time with them and allowing their imaginations to create something special. Fifth generation sewers! MY three kids all want to learn to sew. What great tools these are! I have four little helpers that want to learn to sew. My son wants to sew stuffed animals for charity and my daughter recently asked me to teach her to sew. I also have two tiny tots who love to watch and play with the scraps who will be sewing soon enough. It was watching Sewing with Nancy that made me want to learn, and her book will be perfect for introducing my children to it. My granddaughters are 5 and 3 and love to spend time in the sewing room. They sit on my lap as I sew but I think their favorite part is playing in all the buttons and choosing fabric for their next dress. I can’t wait until they are old enough to create all these items in the book! I started sewing with my older daughter when she was 3. She is now 8 and loves sewing. I have another daughter that is 5 that I hope will be interested in sewing with me someday soon. I have a niece who is really enjoying learning to sew and loves to have me make dresses for her. I also have a son who is 4 who loves to “drive” the sewing machine and has made a two pillow cases now. He has lots of plans for other projects too. My daughter is not quite 2, and I have no doubt she will want to sew ALL the clothes for her baby dolls and herself–she’s a girly girl. I enjoy seeing with my soon to be 4 year old granddaughter, Amelia. She likes pinning the fabric and she will sit on my lap and help guide the fabric while I push on the foot pedal. It’s actually my littlest small who asked me to help her make a dress which prompted me to dig out my sewing machine and now I’m addicted. I wasn’t a very good teacher though and she got bored so some fun easy projects are just what we need to have another go. The big small would love it too I think. My 4 year old loves getting in sewing time. We have made little projects and she loves helping to design the dresses I sew for her. This package would be lovely for us to spend more time together sewing. I’m fortunate to be a grandmother and I’m looking forward to teaching my grandchildren to sew. My 3 year old grandson is becoming very interested since I sew and embroider quite a few things for him. These items sound like they would be great for sharing with him. Thanks for everything you do and share! I have a wonderful Granddaughter age 7 and a wonderful grandson age 4. I would love to teach them to sew. This item sounds like it has so many interesting projects to teach both of them. I am sure we would have hours of fun. Thank you for all you do! Hello, I started sewing 2 years ago. Now I have a 6 year old who is getting interested in sewing too. Her name is Charlotte. I would love to get her more involved in sewing. She would be so proud of herself. A good friend of mine had 5 children one of her quadruplet daughters passed away this past summerdue to complications she hadn’t since birth. One of her sisters who is 12 is learning how to sew all on her own and creating clothes for her dolls. I would love to be able to bless her with this gift. I would love to do some projects with my son. I have three daughters I want to teach. Would love this! Would love to teach my granddaughter & great granddaughter to sew. What a fantastic giveaway! I have a son and a daughter that love to play on the sewing machine – What a wonderful giveaway! I have loved watching Nancy for so many years. I learned so much from her show. The little one I will be teaching to see is my granddaughter. She loves helping Hunny sew already. My daughter Jamie already loves shopping for fabric and can’t wait to start sewing. I would love to teach my daughter how to sew. She has a very good flair for fashion. She has shown her creativity since she was a little toddler. She would use my scraps to make outfits for her Barbie dolls. I believe that she would be more creative and make new outfits for herself easily if she knows how to sew. I am hoping to teach my daughter to sew this year, so this would be wonderful to use with her! Believ3 it or not…..my grandson! He is amazing! And every young man needs to know the basics! I have 2 lil partners, my granddaughters, ages 4 and 6. I’ve been letting them get a feel for the sewing machine, just sewing random pieces of fabric together to make small doll quilts. This would be great and give them more options than I can dream up, and would be so fun to do with them. I want to teach my granddaughter. Even if she finds out she doesn’t like sewing, she should be familiar with a machine and how to mend and hem. My little partner will arrive in the next few weeks. It’ll be a few years before she is ready to sew, but this Grandma (almost) will be ready to teach her! My little partner is my niece who always admires my sewing projects and is absolutely wowed by my fabric stash! She loves to putter through my sewing room and wants to learn! 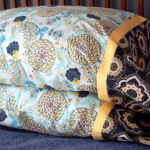 I have two granddaughters that are ready for new projects – we have made several pillowcases. I would love to win the sewing items for them. And the book would be great for them to pick their next project. So many choices for them to make something fun. Thank you! My granddaughter will soon be five . We have sewn some seams together and it would be great to start some projects. My granddaughter who is 9 has asked me several time to teach her to sew. We made a purse together which she carried around and enjoyed. This book would be so helpful in teaching to sew. Hope I win. I have three granddaughters who are eager to learn to sew. This would be a wonderful start to their education. My new sewing partner would be my two granddaughters , four and five. I want to share and give them this precious gift. My youngest niece is 9. I would love to spend some time sewing with her. I would like to sew with my two granddaughters. They have little sewing machines they are eager to try out. They are nearly eight and nearly eleven. My little partner would be my 7 year old grand daughter. She went shopping with great grandma and me today at the quilt shop. What fun! My partner would be my 6 year old grandson. He has always been interested in my sewing tools, fabric and even the sewing machine. I would love to have this collection of great tools to properly get him going! I can’t wait for my new grandson to be old enough to use these with if I’m lucky enough to win! I’ve been teaching my daughter to sew on her Janome Hello Kitty Machine that she got two Christmases ago. She has learned so much and loves it. This are some great ideas for sewing with kids. Thanks for posting!